Dynamic Spectrum Management (DSM) is a research program within the Space, Telecommunications, and Radioscience (STAR) Laboratory, a research group of the Department of Electrical Engineering of Stanford University. Researchers at DSM are investigating the potential for DSM to be used in multiuser environments, with particular emphasis on DSL and wireless transmission channels. Broadly speaking, topics covered through their research on DSM for DSL include: Channel Identification Methods, Spectrum Balancing, Vectored Transmission Methods, and Multiuser Detection. The website provides information on these different areas and links to related publications. 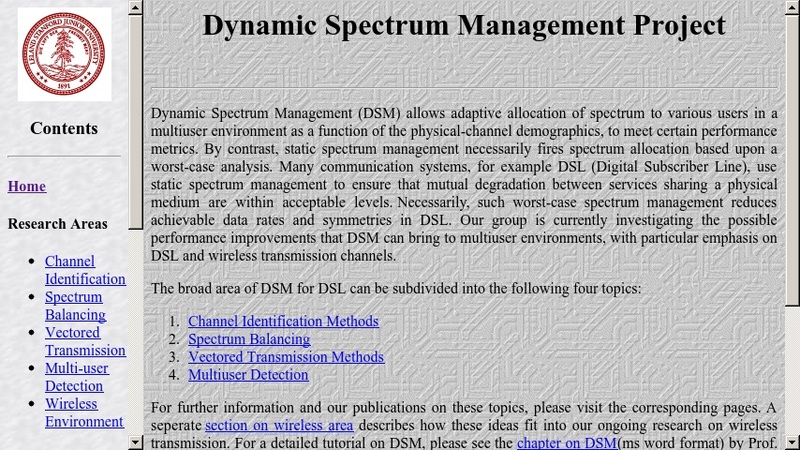 The Tutorials section offers some papers and presentations explaining the basics of Dynamic Spectrum Management. A separate section includes papers on Standards Contributions.